It’s the middle of January, which means you’re either working hard to accomplish your fitness resolutions, or you’ve already given up and are working your way through a pizza-wrapped shame spiral. But it’s not too late to hop back on the fitness wagon, and Studeo Gyms are here to offer the ultimate motivator: $10,000 CAD for the individual who shows the most fitness progress between now and March. And they want to let one lucky Daily Hive reader win a free entry into the competition. And if you’re already interested, you can sign up here. So here’s how it all goes down. If you’re not already a member of Studeo Gyms, then it will cost $400 CAD for you to sign up, but that fee includes access to the Studeo facilities and unlimited classes for 60 days. 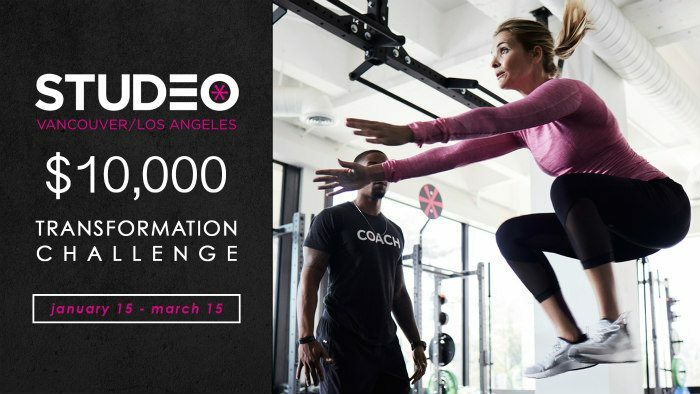 Enter for your chance to win free entry ($400 value) to Studeo Gyms’ transformation challenge, where you could win $10,000 CAD. Win free entry to the @Studeo Transformation Challenge via @VancityBuzz RT to enter! Contest entries will be accepted from time and date of publishing until 11:59 pm PST on January 15, 2018. One winner will be chosen at random and contacted through the platform they enter by. For more information, visit Studeo Gyms. Check out the gym on Facebook, Twitter, and Instagram to get the latest updates.